Here's what went down during the biggest night in music. 1. 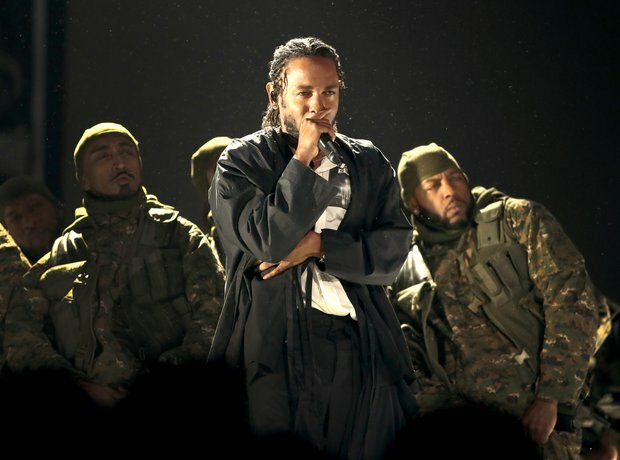 Kendrick Lamar kicked off the show with a powerful, politically-charged performance. The Compton rapper lit up Madison Square Garden with a number of 'DAMN.' songs in a performance that blew audiences away. 2. The rapper lit up the stage! 4. Jay Z caught up with was while Bey and Blue were greeted by Alicia Keys. 5. Blue appeared to have some words for her father while he caught up with show host James Corden. 6. 'LOYALTY' collaborators Kendrick Lamar and Rihanna linked up at the Madison Square Garden show. 7. Migos and Cardi B sat together during the ceremony. 8. The 'CULTURE II' rappers stood out in their black-and-gold ensembles. 10. The R&B songstress joined Bryson Tiller and DJ Khaled for the feel-good performance of the night. 11. The star looked very pleased with her performance. 12. Bruno Mars scooped up six Grammy Awards on the night! 13. The R&B crooner picked up his award for Album Of The Year. 14. Mars and Cardi B posed backstage together ahead of their hotly-anticipated performance. 16. Rihanna and Kendrick Lamar accepted the award for Best Rap/Sung Performance for 'LOYALTY'. 18. The most nominated female of the evening, SZA, performed her hit 'Broken Clocks'. 19. P!nk thanked Rihanna for meeting up with her daughter, Willow, backstage. 22. Alicia Keys looked stunning in black gown as she presented an award during the show. 23. Big Sean caught up with Sir Elton John during the prestigious ceremony.